The high price of silver is rewarding some of us. The values of silver coins, and jewelry has appreciated to a point where many people who never thought of owning silver are now buying. As the dollar drops to historical lows and the price of oil continues to increase as never before, precious metals like silver, gold, copper and platinum keep moving onward and upwards. If you own a metal detector then you are already involved with a hobby that can bring rewards based on the high price of silver. Many detectorists are finding silver coins and jewelry that can help pay for a new metal detector, and MORE. If you have been thinking about purchasing a detector, perhaps you should make that purchase now and cash in on the silver boom. Here are five places that hold many silver coins. I know many people who metal detect around old schoolyards just to dig up the silver coins that were dropped by students. You will dig many newer coins also, better known as clad coins due to their metal content. However, if you are persistent, the silver will appear. Parks, especially the older parks are a great place to search for silver coins and jewelry. Like the schoolyards, you need to dig quite a few plugs because of the amount of clad coins and trash that are there, but keep digging; the silver coins and jewelry will eventually be found. Personally I love the old amusement parks, try them. You need to dig lots of trash, but the amount of silver coins you can find, and with the price of silver at an all time high, it will be worth your effort. Here is another area I love to metal detect in. Many of the old fair grounds are no longer in use. However, that’s a good sign. 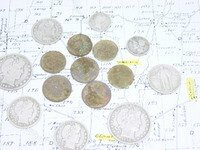 It means if you can locate them, you may be the only one who has done so, and of course, you will have a great chance of finding many silver coins. Old churchyards are great. Here’s why. When this country was first settled, and for hundreds of years later, the church was the foundation of every town, village and hamlet. Picnics and church functions were a common occurrence. Also held on church grounds were many town meetings. It is a rare instance when I do not find silver coins on the grounds of an old church. And many of them have increased in value due to the high price of silver. Here’s a word of advice. Always ask permission to detect around the old churches. It is not hard to locate the current pastor, most live close by to the church. Asking permission to metal detect on any private property gives you and the hobby an air of respectability, and increases your chances of getting permission the next time you are out metal detecting. And with the price of silver being as high as it is, it's worth the chance to try all of the above. Visit my store and see what great deals there are on metal detectors, accessories, and much more. With the high price of silver you can end up having your detector paid for with your finds. Be sure and visit my homepage!